O Past Perfect ou Past Perfect Simple (Passado Perfeito ou Passado Perfeito Simples) é um tempo verbal usado para expressar ações passadas que aconteceram antes de outra ação que também ocorrera no passado. Nesse tempo verbal é comum as frases serem formadas por alguns advérbios. O Past Perfect é formado pelo verbo auxiliar to have conjugado no Simple Past (had) + Past Participle do verbo principal. Já os verbos irregulares, não seguem nenhum modelo ou regra de conjugação. Assim sendo, a melhor forma de conhecer suas flexões é consultar uma tabela de verbos. You had changed your clothes before the end of the party. (Você tinha mudado suas roupas antes do final da festa). É usado para indicar ações no passado que ocorreram antes de outra ação no passado. 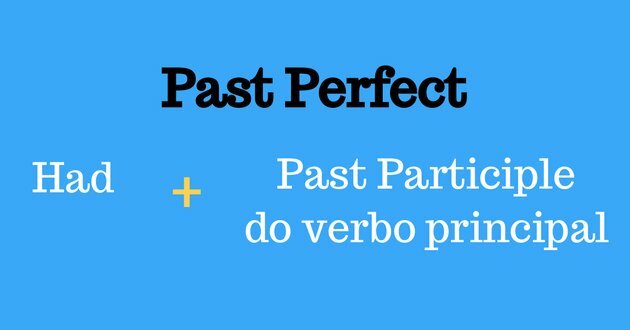 O Past Perfect Simple é formado pelo verbo auxiliar to have conjugado no Simple Past (had) + Past Participle do verbo principal. É usado para indicar a continuidade de ações no passado que ocorreram antes de outra ação no passado. O Past Perfect Continuous é formado pelo verbo to have conjugado no Simple Past (had) + verbo to be conjugado no Past Participle (been) + gerúndio do verbo principal. Assista o vídeo abaixo com um resumo do uso do Past Perfect e fique por dentro desse tempo verbal. The tube pulls in to a busy station along the London Underground’s Central Line. It is early evening on a Thursday. A gaggle of commuters assembles inside and outside the train, waiting for the doors to open. A moment of impatience grips one man who is nearest to them. He pushes the square, green-rimmed button which says “open”. A second later, the doors satisfyingly part. The crowds mingle, jostling on and off the train, and their journeys continue. Yet whether or not the traveller knew it, his finger had no effect on the mechanism. Some would call this a “placebo button”– a button which, objectively speaking, provides no control over a system, but which to the user at least is psychologically fulfilling to push. It turns out that there are plentiful examples of buttons which do nothing and indeed other technologies which are purposefully designed to deceive us. But here’s the really surprising thing. Many increasingly argue that we actually benefit from the illusion that we are in control of something – even when, from the observer’s point of view, we’re not. In 2013, BBC News Magazine discovered that pedestrian crossings all over the UK were the wellspring of placebo buttons. A crossing in central London had programmed intervals for red and green lights, for example. Pushing the button would only impact the length of these intervals between midnight and 7am. ___ several other cities during busy periods, the crossings were programmed to alternate their signals at a specific rate. The buttons did nothing, but a “wait” light would still come on when they were pressed and, yes, people still pressed them presumably believing that their actions were having an effect. Certain psychologists would argue that the buttons were indeed having an effect – just not ___ the traffic lights themselves. Instead the effect is in the commuter’s minds. To understand this you have to go back to the early 1970s. At that time, psychologist Ellen Langer, now a professor ____ Harvard, was a Yale graduate student. During a five-card draw game of poker she dealt one set of cards in a haphazard order. “Everybody,” she says, “got crazy. The cards somehow belonged to the other person even though you couldn’t see any of them.” Langer decided to find out more about the way people regulated the playing of such games. She went to a casino where, at the slot machines, she found gamblers with elaborate ways of pulling the lever. At another time a “highly rational” fellow student tried to explain to her why tossing a pair of dice could be done in a certain way to affect the numbers which came up. “People believed that all of these behaviours were going to increase the probability of their winning,” she comments. Also, if pedestrians wait together at the crossing and a few press the button impatiently, that creates a sense of togetherness with strangers which might otherwise be absent. All of these things may be taken as positive impacts on our mental state, and even socially reinforcing. It’s something to think about next time you cross the street. In the sentence “A crossing in central London had programmed intervals for red and green lights”, the underlined verbal locution is in the ________________. If we put it in the present perfect continuous, it would be written as ______________. Mark the alternative that correctly and respectively fill in the blanks above. A letra b) é a alternativa correta pois "had programmed" segue a estrutura de formação do Past Perfect : had + verbo principal (neste caso to program) no Past Participle (programmed). Present Perfect do verbo to be (has been) + verbo principal no gerúndio (programming). a) Had you been waiting long before the airplane arrived? b) You had not studied English before you moved to Brazil. c) We had had that car for fifteen years before it broke down. d) Before I came here, I had spoken to Jonh. e) He had written a letter to Carlos. Alternativa correta: a) Had you been waiting long before the airplane arrived? A alternativa a) apresenta dois tempos verbais mas nenhum deles é o Past Perfect: 1) Past Perfect Continuous (had been waiting) e 2) Simple Past (arrived). I watched a good film this weekend. I had watched a good film this weekend. I had not watched a good film this weekend. Had I watched a good film this weekend? Sujeito + verbo to have no Simple Past (had) + verbo principal no Past Participle + complemento. É importante referir que no Past Perfect, as flexões verbais são iguais para todos os pronomes pessoais.